Picture yourself relaxing in the comfort of this beautiful, newly renovated, ocean-front condo on the world's most beautiful beaches. Enjoy the spectacular view of the sugar white beaches and emerald green waters of the Gulf of Mexico from the private balcony. The condo has been completely renovated and newly furnished and decorated to provide a relaxing getaway with luxurious accommodations. You will find everything you need including a king size bed in the master bedroom, a sleeper sofa and two full baths. The condo is on the 4th floor and overlooks one of two swimming pools, has a fully stocked kitchen, two flat screen HD televisions, and a washer and dryer. Located on Thomas Drive, Pelican Walk is a family-friendly complex that is convenient to five golf courses, fishing, diving, amusement parks and the area’s best restaurants. If you prefer to stick close to “home”, the complex has two swimming pools (one seasonally heated), heated spa, sauna, pool tables, shuffleboard courts, tennis courts, video games, and a indoor racquetball court. Plenty of free onsite parking. 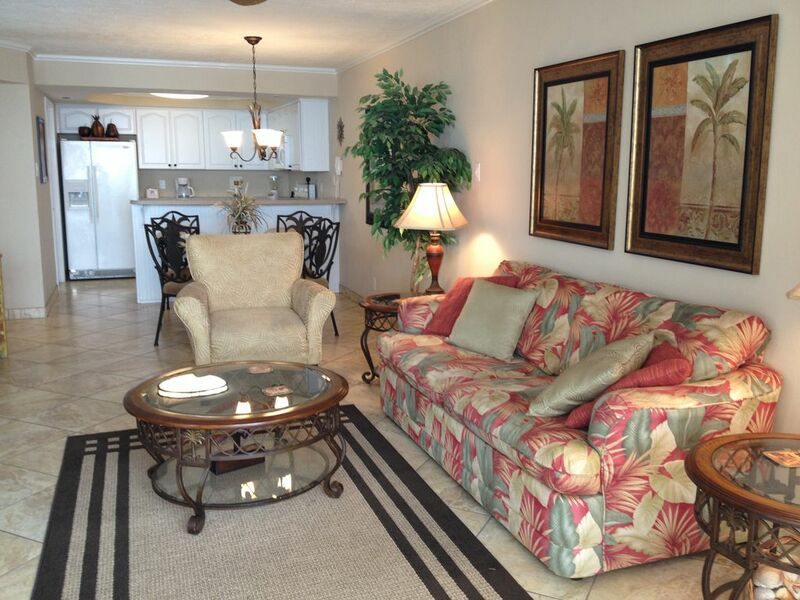 Condo located in Pelican Walk resort at 6905 Thomas Drive, PCB. So what are you waiting for…………reserve condo today! We live only 120 miles away and come to PCB often. We have stayed at Pelican Walk and loved the quiet part of the beach and the smaller building size, only ten floors. We bought this condo in 2008 and and loved the place so much we bought the one above it in 2011. This condo unit is on the fourth floor and we love the direct view of the Gulf and the sound of the waves. Also, there are five golf courses within five miles. Very pleased with the condo. Very nicely furnished and very clean. Loved the view of gulf and the common areas were first class. Will definitely be back. We chose this location so that our dog could come with us. Did not know hovever that the beach is not pet friendly. There are certain places miles down the road you can take your furry friend but not infront of this condo. That is beach patrol rules not the condos. The condo was very nice and the people were also friendly. I would recommend staying here. I absolutely loved it! I loved being able to make breakfast while having the gorgeous view of the beach. Step outside on the balcony and drink my coffee watching the waves crash in every morning. Quite and relaxing but very close to all the restaurants. Will definitely be staying here again. Glad you enjoyed your stay. We are proud of our beach place and hope to have you visit again. This condo was top notch! My husband and I enjoyed every moment spent here. The condo is fully furnished and extremely clean and comfortable. We will seek this condo out every year going forward. We could not be happier with this accommodation. My husband and I had such a wonderful time in Panama City Beach and this is such a beautiful condo. We loved that we were able to bring our two dogs along. That made it seem so much more like home. This unit was very nice and the other things we looked at that were comparable price wise, were not even on the beach. There were plenty of restaurants nearby. We were a little disappointed that we could not see the sunset from our balcony, but is was a great view from the pool deck right below. We also found the bed to be a little soft, but in a previous review someone said it was too hard, so I guess that is just a preference thing. You can't please everyone with every detail, but overall it was a great experience. It is also very close to the beach. I have stayed in condos right on the beach where you still had to walk quite a long way to the beach, but here it is very close. The dog walk area is way too far away from the building at Pelican Walk. When I checked in they actually mentioned that and said if your dog can't make it, just clean up after them. So it all worked out ok. we would definitely stay here again. The condo was also very clean. My husband and I are both really picky about cleanliness and we had no complaints whatsoever in that department. We have always stayed at the west of PCB near Pier Park, we decided to try this unit as it is pet friendly. We loved everything about this condo! The condo was beautiful and very clean. The king size bed was very comfortable. The location was fantastic, this section of beach was quiet but yet close to everything. The grounds were very well kept. I have never found so many shells any place else on PCB. Will definitely stay again, can't highly recommend enough! Glad you enjoyed your stay! Look forward to you coming back!